This easy peasy Pea Coconut Mint Soup with zucchini is super delicious and very quick to make. It’s super healthy and can be served as a starter or light meal. This is my go-to soup if I am short on time or don’t have time to go shopping for groceries. Frozen peas, dried mint, coconut milk, stock cubes and (frozen) kaffir limes are part of my standard kitchen staples. If your pantry, fridge and freezer are always stocked with healthy and easy to prepare ingredients, it’s easy to whip up a healthy meal, even if you are super busy. 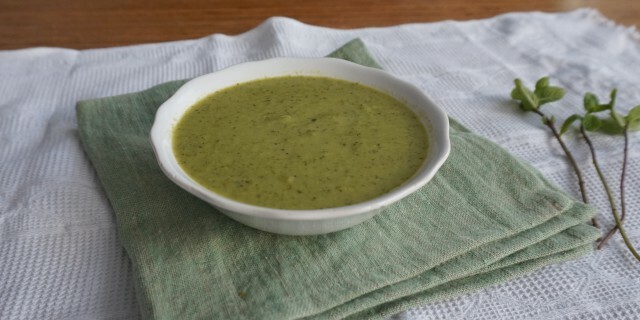 Enjoy your easy peasy Pea Coconut Mint Soup! Heat coconut oil in a large sauce pan. Sautée the shallots at medium-high heat for 4-5 minutes and then add the zucchini. Sauté for 5 more minutes. Add the stock, coconut milk, kaffir lime leaves, dried mint and sweet peas. Bring up to a boil, reduce heat and allow to simmer for 15 minutes. Remove from heat and season with freshly ground black pepper and sea salt to taste. Remove the kaffir lime leaves and use a hand-held blender to create a silky smooth consistency. Serve with fresh mint leaves.